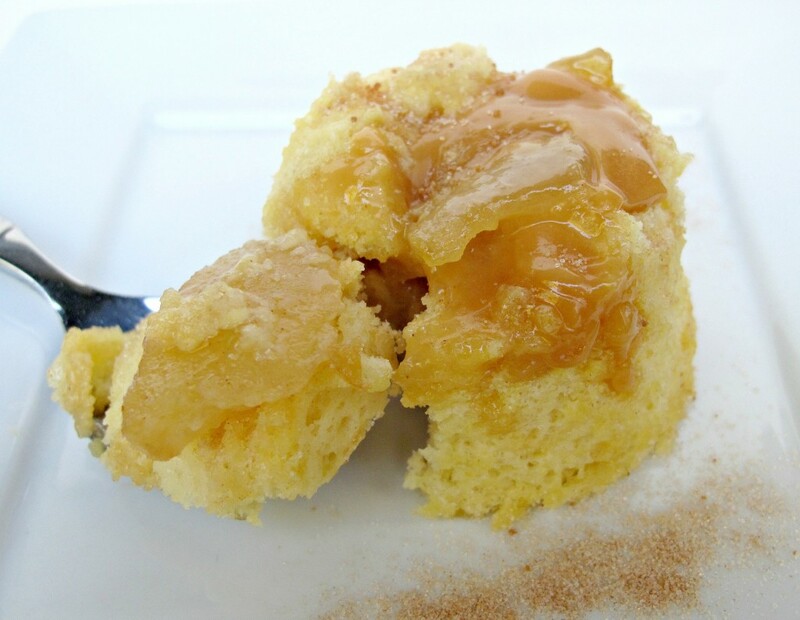 Warm Caramel Apple Mug Cake is a cozy treat that can be enjoyed literally at a moments notice! 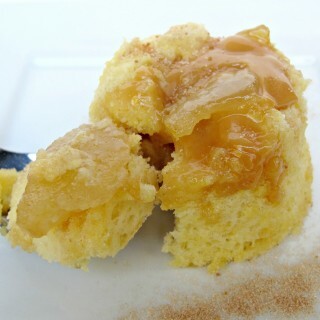 Moist vanilla cake is filled with spiced apple slices and melted caramel. 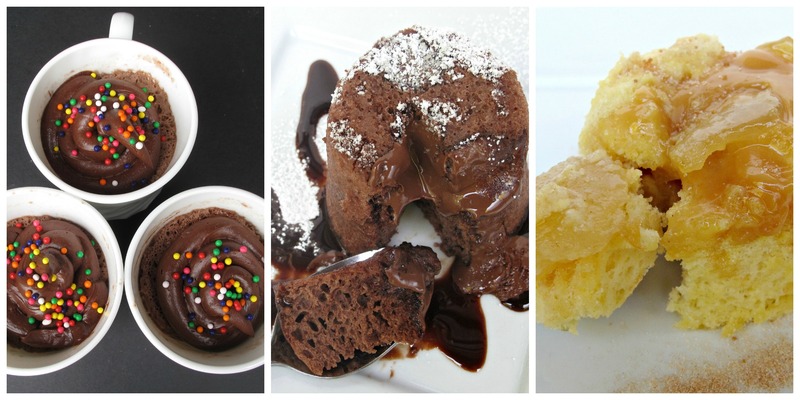 This cake mix microwave mug cake can be ready to eat in just one minute! Baking away in my cozy little niche of care package recipes, I can’t always be a part of blogging trends when it comes to seasonal flavors. The summer flew past without any Monday Box recipes using fresh fruits or vegetables. Due to the high moisture content, baked goods containing fruits and vegetables don’t travel well and are more prone to spoil. (Read my guide to Shipping Baked Goods in Hot Weather ) Instead, Monday Box bars and cookies using extracts and colorful chips offered a taste and look of summer. 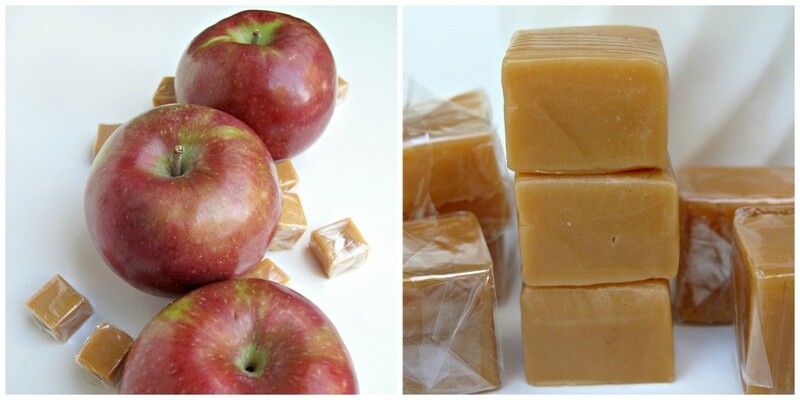 Now the buzz is all about fall flavors; Halloween candy, pumpkin, caramel, and apples. These flavors are mailable. 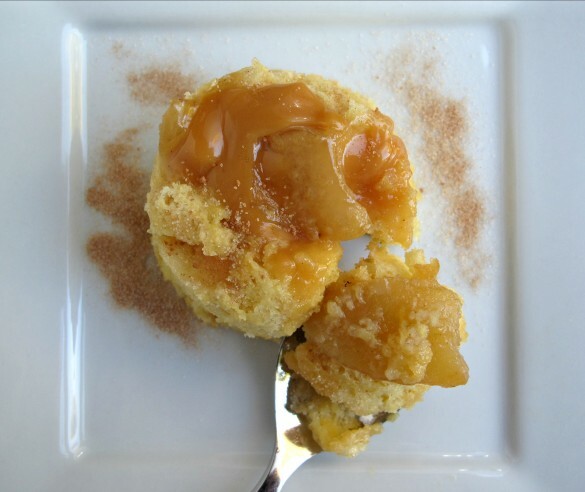 Caramel Apple Mug Cake is fall in a steamy mug of vanilla cake, gooey caramel, and spiced apples. A sweet autumn treat that goes from craving to reality in 1 microwave minute! This fall flavors care package is perfect for anyone with access to a microwave. At the end of last school year, I went to retrieve my son in Chicago after his grueling round of sophomore year finals. He owned 6 mugs. All 6 were stacked in his room awaiting washing (I don’t want to think about exactly how long the wait had been.) My son’s room was on the 4th floor and the only kitchen sink was in the basement. The studying time crunch of Exam Week required 3 a.m. munchies and provided no time for dish washing. 3-2-1 mug cakes excellently filled the bill for quick sugar fixes at odd hours, but left that pile of mugs. Too bad I hadn’t though then to send him disposable microwave safe cups/mugs. I am suggesting it now. If your 3-2-1 Caramel Apple Mug Cake care package recipient is a college student, include disposable microwave safe cups with handles. 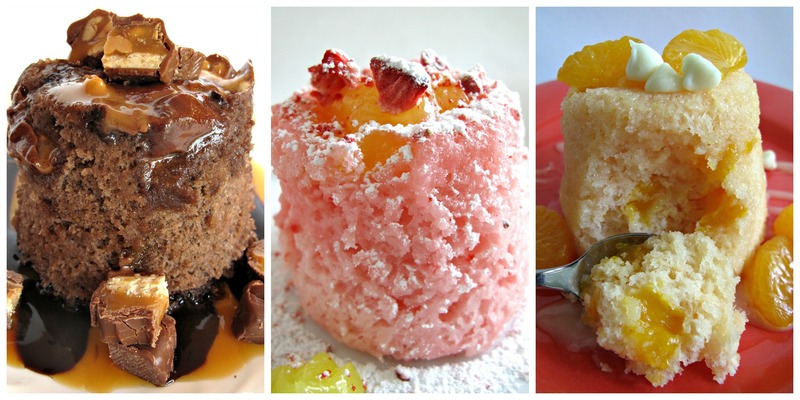 My friend and fellow blogger, Gina, commented the last time I posted a 3-2-1 cake recipe, saying she thought that aerosol cans were not allowed in overseas military care packages. I double checked, and confirmed that the aerosol cans of Pam I had previously suggested can not go in overseas 3-2-1 mug cake care packages. No worries. The disposable microwave safe cups are also perfect for military care packages to troops with access to a microwave. I will update my previous posts. (Here comes the 3-2-1 part) Into the prepared mug, stir together 3 tablespoons of cake mix and 2 tablespoons of water. 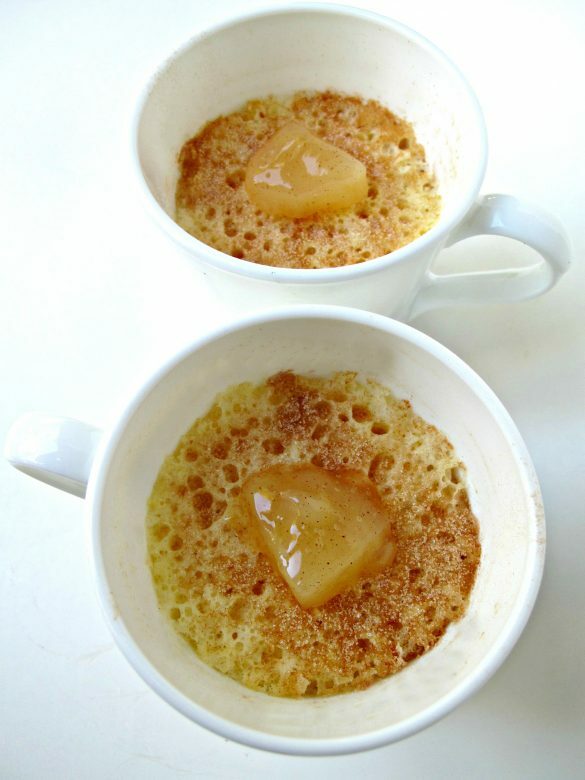 Cut a slice of canned apple in half and place on top of batter in cup. They will sink in. Gently press together three caramel squares one on top of the other forming a tower. Push the caramel squares down into the center of the batter. The cake will rise around the tower, so don’t worry if some of the caramel is not submerged. Sprinkle the top of the cake with cinnamon sugar then eat it right out of the mug. If you want to transfer the cake onto a plate, run a knife around the edge between the cake and the mug to loosen, dump out onto a plate, then sprinkle with cinnamon sugar. 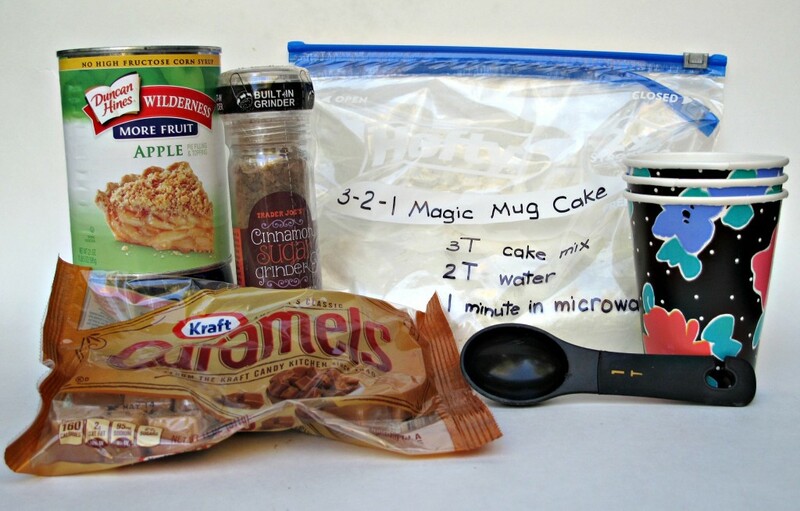 Combine the two cake mixes into a labeled gallon-size ziplock bag. Include a measuring spoon, bag of caramels, can of apple pie filling, and a jar of cinnamon sugar. If the care package is international, include microwave safe paper cups. If the care package is domestic, add either a can of non-stick spray (for use with a ceramic mug) or microwave safe paper cups. Write out directions on an index card or directly on the ziplock bag. For a special touch, include a mug and spoon. Who knows what amazing things will be common place by the time your son is in college, Monica. 🙂 Though dorm life will, I think, always be unique in that dorms house large numbers of young people new to independent living. I don’t think washing dishes, doing laundry, or changing sheets will ever be a priority! 🙂 I am glad I solved the 3-2-1 cake dirty mug dilemma. These silly yet magical 3-2-1 cakes seem to appeal to a variety of people. They are the most popular “recipes” on my site! College students are high on the list but many 3-2-1 fans are people who want a quick snack without actually baking, or without needing lots of ingredients, or wanting a single portion. Thanks! This is my favorite flavor of 3-2-1 cake so far! Looks so fun and so good! Thanks, Chris! Its not real baking, but it is fun and fast and surprisingly good! reading this post makes me feel guilty. well as a mom, if eel like i’ve been amiss with my role for not being able to send care packages to my kids. its been almost a month since i came back and the stuff i got them from the Philippines aren’t mailed yet. Also, baking is not my forte Wendy, I wish i had yours. But this morning after reading your post, I went to my kitchen and forced myself to bake. And i did bake… not just one, but 5 different kinds of goodies for my kids. Well it’s not like your 3-2-1 cake but I’m sure my kids will love them. Thank you for the inspiration… and shh… i baked from a cake mix that Kursteaz sent me hahaha. but I know it won’t matter right? Thanks for your time last Friday I really enjoyed the breakfast we had together. I didn’t realize how time flew by fast. A parking ticket was waiting for me by my windshield haha. But it’s all worth it.. I hope to do it again sometime with you. Oh, Malou! I am so sorry you got a ticket! Time did fly by and I felt like we had only just scratched the surface of things to talk about! I had so much fun. Lets do it again soon…someplace with a free parking lot! 🙂 And as for guilt…throw it out the window. I want my blog and posts to serve as inspiration, not for them to be guilt causing. It makes absolutely no difference if a care package goodie is from scratch or a mix. Both include love and thats ALL that counts! Plus, I would believe that you prefer to cook savory foods over baking, but I happen to know that you are a very talented cook and you probably bake with equal amazing results! Have a great end of the week and a wonderful weekend! I wish someone had sent me such loveliness when I was in college, back in the day! 😉 This sounds great!! okay, so it goes without saying that those little caramel apple cakes would make anyone happy; i love them. they would be dangerous here. but your tip about sending along disposable mugs? that’s the single best tip i’ve ever heard if you’re sending these for care packages. BRILLIANT. i know from personal experience that cleaning cake mugs isn’t always fun, AND that i actually tend to break mine after repeated use. obviously if you sent anyone this as a care package, there would be repeated mug use. 🙂 great tips, wendy, and a great recipe. This is such a great idea Wendy! Especially for sending overseas where they might not even have access to apples. They can have a taste of fall – and home. But I love this cake too! So many times I’m looking for a quick treat and I hate premade cookies and snacks.This is perfect. Do you think it is possible to make a bigger 3-2-1 cake by using the same proportions but bigger sizes? Ex: 6 tablespoons of mix, 4 of water with whatever time it cooks in? Hi, Sana! Yes! I have been able to adapt the proportions for different sized mugs. Sometimes it take a few trial runs to get the amounts and timing right. Have fun! What a good recipe full of luscious flavor. And easy! Thank you, Emily! I agree, mug cakes are so much fun, especially when they are made completely with ingredients that are sitting in the cabinet waiting to be transformed! 🙂 Thanks so much for sharing and for hosting Home Matters Party! 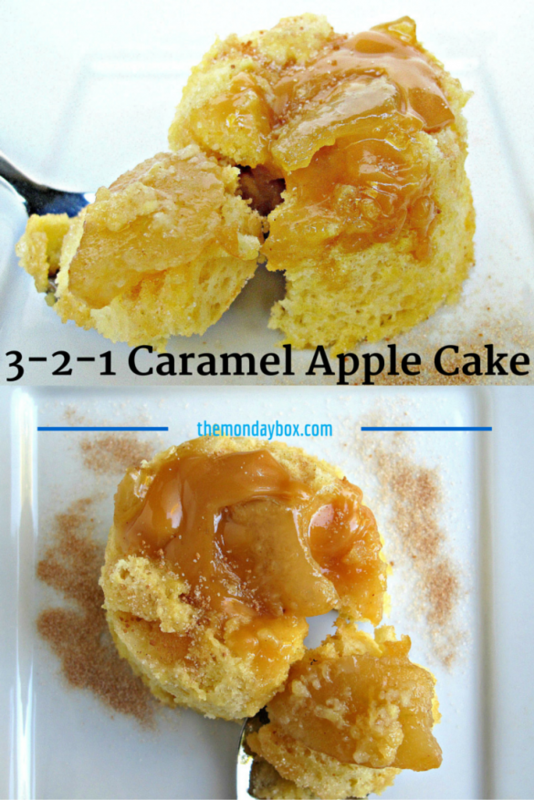 This caramel apple cake looks like a very yummy cake for dessert or for snacking. It certainly would taste delicious. Thank you for sharing the recipe with us. Thank you, Elva. 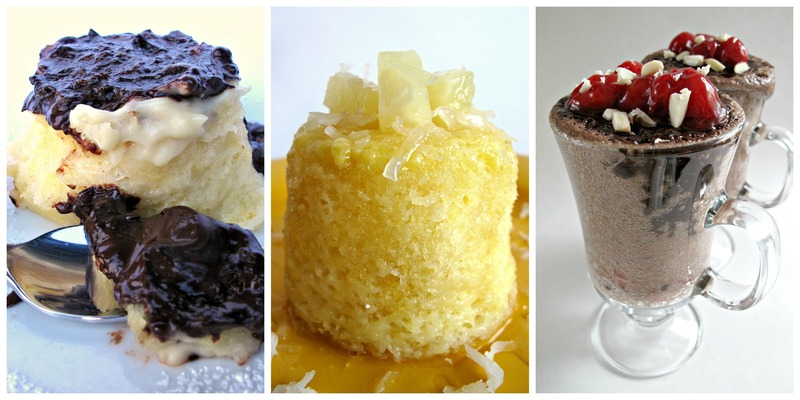 Mug cakes are a fun way of enjoying a quick treat!